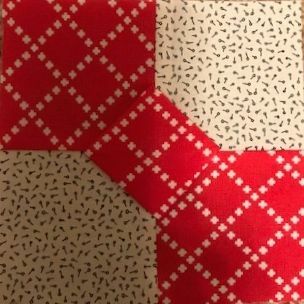 Angie at Quilting on the Cresent was kind enough to post a tutorial for this week's block. It is an adorable 3-dimensional bowtie block. Check out her post for directions or look at the PDF file here or on the RSC19 Sampler tab. This one should be set on the diagonal. Use the instructions for that are also on the RSC19 Sampler tab. Looks like a fun block, I've never tried a 3-d bow tie before. Lots of fun tiny Tuesday blocks this year. Oh, I missed this one. Maybe I should try? It's a fun block.